Gant ar ger Las Vegas e tegouezher amañ. Evit sterioù all ar ger, gwelit Las Vegas (disheñvelout). 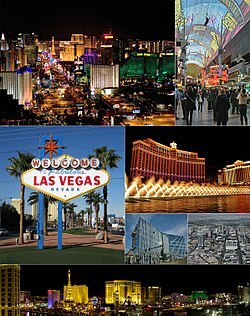 Las Vegas (distagadur amerikaneg: ([lɑːs ˈveɪɡəs]) – Naʼazhǫǫsh Hátsoh e navac'hoeg) eo ar gêr vrasañ e stad Nevada, hag unan eus kêrioù bras ar Stadoù-Unanet (an 30vet hini). E 2010 e oa 583 756 a dud o chom e kêr ha war-dro 1,9 milion a dud en holl gant an trowardroioù. Brudet eo Las Vegas er bed a-bezh evit ar c'hoarioù arc'hant a vez graet eno noz-deiz, hag an dimezioù war ar prim. A bep seurt lesanvioù he deus: The Gambling Capital of the World (kêr-benn bed ar c'hlaoustreiñ), Sin City (Kêr Bec'hed), The Entertainment Capital of the World (kêr-benn bed an dudi), Capital of Second Chances (kêr-benn an Eil chañs), The Marriage Capital of the World (Kêr-benn bed an dimeziñ). Unan eus ar c'hêrioù touristelañ eus ar bed eo gant 37,4 milion a weladennerien e 2004. Kemmoù diwezhañ degaset d'ar bajenn-mañ d'an 11 Ebr 2016, da 01:48.